What I'll do in Audio-Activity will be very close to Public Service Advertising. My columns will describe thoroughly the birth of a record in the catalogue Velut Luna and how it is recorded. This is a good way to give to the audiophile the tools to understand "what" is important to listen to in his HiFi equipment. A typical question is " what is it right to listen from a stereo system? The sound of a live performance or the sound of a recorded performance?" The answer could be "both things" However, while the sound of a live event should be familiar to audiophiles, what is portrayed in records is most of the times unknown to listeners. My columns are focused on records that are regularly on sale and want to give you a tool to understand and appreciate it. It may also be useful to understand how your HiFi works. It's a musical production that cannot be catalogued in a definite style. 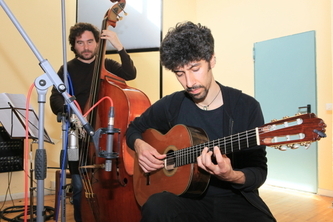 All the songs are original compositions of the guitar player Pietro Ballestrero. He plays Jazz but has also a solid classical tradition. This record portrays a whole range of emotions and colors. The group is thus composed: string quartet - 2 violins, viola and cello - jazz double bass played mostly plucked, without bow; classic guitar and semi acoustic jazz that plays solo but also in ensemble, solo clarinet in 7 tracks out of 10. At the clarinet we find one of the most important jazz musicians in the world: Gabriele Mirabassi. As I said this is a minimalist music due to the interaction of the bow quartet but it's also very melodic in the parts where guitar and clarinet play solo. We have the typical groove of jazz thanks to the rhythmic of the double bass. My recording philosophy is linked to the concept of a music that may be reproduced and sound just like a live concert even if it's been recorded in a studio. I recorded the whole group strictly live. Velut Luna has a studio designed to reproduce the acoustic of a small auditorium. The "Sala Gialla" is a big space of 140 Mq with a ceiling with a variable height of 4,5 to a maximum of 7,5 meters. It's a room designed with acoustic criteria that guarantees a natural echo of 1,8 seconds, characterized by a slow fading without sound distortions. Wood and stone bricks give the sound a warm tone, well defined, precise and harmonically rich. The position of the elements in the studio is the exact reproduction of their disposition during live events. They set themselves in a semi-circle, going from left to right we find: first violin, second violin, viola, cello, double bass and guitar. The solo clarinet has a central position, in front of the group but separate from them by high "separating" panels that are semi-opened. 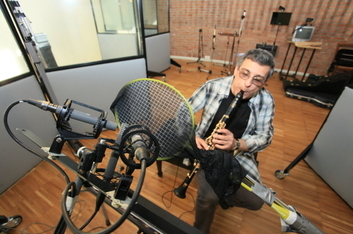 In this way we can control better the different and bigger acoustic pressure of the clarinet compared with the group. The use of these big panels in this big room makes the acoustic of this space the same for both the clarinet and the group and guarantees tonal homogeneity. I chose two Sennheiser MKH 8020 positioned centrally with respect to the group. The configuration is A-B with a distance of 90 cm. These two microphones are responsible for the 75% of the final sound. I added to these microphones an "accent microphone" for each instrument to guarantee a better micro dynamic and a better music detail. 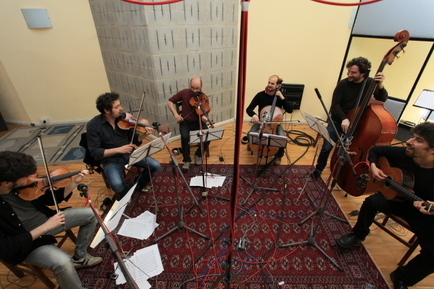 I used for the two violins and the viola three Neumann KM140 small capsules, Neumann TL103 large capsule for the cello, a classic Neumann U87ai for the double bass and a Schoeps MK4 for the guitar. I have used for the clarinet a technique that I have specifically designed for situations like these in which I have to preserve the sound of the place far from the main mic and bring out details and presence typical of the soloist. It's a stereo recording with a technique XY with the addition of a central accent mic coincident. The microphones used are all Schoeps: two MK4 for the stereo pair XY and a MK4 in the center. It's very easy to damage the signal transmitted by the microphones with choices that are not very accurate, therefore I put a lot of care in this process, starting from the cables, going through the microphone preamplifiers up to the AD conversion stages. In this recording I have used the high quality Mogami Starquad microphone cables, very short - less than 5 mt - all connected to Millennia Media HV-3D pre positioned close to the microphones themselves. Straight to it the multichannel AD converter Prism Sound ADA - 8HR connected to the Millennia pre with litz cables 1 meter, custom made, very high performance, that we could call "Velut Luna Wired". At the outputs of the Prism Sound Converter we have used digital cables AES/EBU 18 meters long to reach the control room. express RME AES32 (only digital 16in /16out), integrated with a custom PC used solely as a support for the recording software Samplitude 11 PRO. All this in standard PCM 24bit/88,2 kHz. I use DAW as a recording device. I do not use any of the classical digital plug in when mixing, exception made for the digital delay on each track and level automatisms just because mixing and mastering are done in the analog domain. I'm convinced that starting from six recorded track onward (in our case we had 11 tracks to mix) the digital mixing has limits due to the headroom limitation to 0.0 dB, typical of the digital. In a digital mixing - to avoid clipping - we have to dull the single tracks, sacrificing detail, resolution and dynamics. Using a high quality analog mixer we bypass the problem, we will have a full resolution recording thanks to the +24 dB headroom that in our case is supplied by Neve 8816 mixer. To mix analogically we have to convert first in an analog domain the single tracks. We did it with DA Prism Sound ADA -8HR. Very important is the phase realignment of the single accent microphones with respect to the main stereo microphones. The sound has its own speed so to eliminate the so called comb filtering it's necessary to realign the phase. This operation is very simple in the digital domain and we obtain it moving all the tracks and making the single signal peak match. You may have noticed that I haven't mentioned equalizers or compressors in fact we have not used them in the mixing phase. I chose to use a light equalizing and a general compression in the mastering phase to complete the big dynamics and tone work performed by Neve when mixing. But don't be afraid, it's nowhere near to the so called "loudness war". 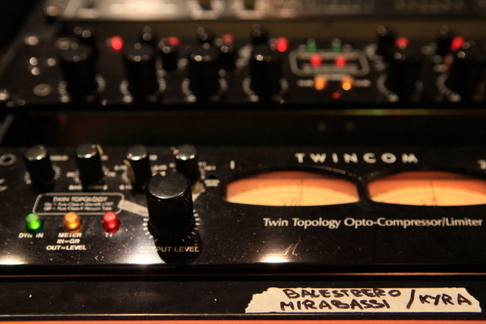 In the analog domain I have connected downstream Neve a chain composed by: Millennia Media TCL-2 twin compressor and Millennia Media NSEQ-2 twin equalizer and limiter Maselec MPL-2. At the end we gave everything a general compression of 2,5 dB to avoid that single excessive peaks could disturb the listening forcing to listen to it at a too low volume. As for the level of equalization I have given freshness to high frequencies applying +2dB shelving eq to 20.000 Hz. The final dynamics value is DR18. At the end of this mix and mastering chain performed all at once, I have transposed the signal in the digital domain through the Prism Sound Ad-2 DREAM in format PCM24/88.2 and within DAW Samplitude 11Pro, that I have also used to downsample to 16/44.1 to prepare the master copy to record CDs. 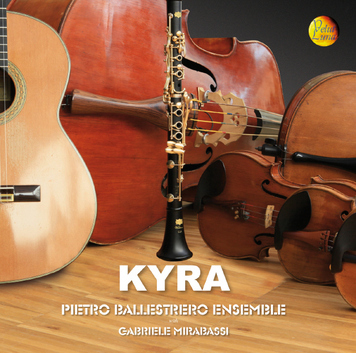 The tone color is very neutral, characterized by the wooden sound of the instruments: the mellow of the classic guitar, the acute of the clarinet and violins, bass control of the viola and the bass of the double bass. The double bass sounds more like a "Bump-bump" than a "Tunc-Tunc". I hope this onomatopoeia makes clear that the real sound of the double bass is not very fast and very controlled in nature but only in the fantasy of some sound engineers. Finally the soundstage. What you have to expect is to hear the semi-circle that you can see in the pictures with the first violin close to the left loudspeaker, the guitar inside the right loudspeaker, the double bass close to the guitar on the right center. Don't expect an excessive sound depth because it was limited to 1 meter behind the viola. The soloist clarinet can be heard in the center, in line with the first violin and guitar. The same happens to the soloist guitar in the track "Verde ". That's about it! Have a pleasant listening now!